The message on Brad Harp’s shirt summed up the situation perfectly – “We Got This”. 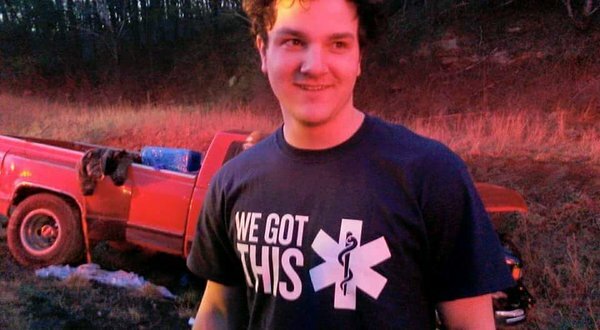 Thanks to some quick action and reliance on their education and training, four emergency medical care students and an instructor from Eastern Kentucky University, played an integral role in a life-saving situation. As they were returning from a conference in Baltimore, MD, EKU instructor David Fifer and EMC students Leah Gaddis, Jon Gaddis, Brad Harp and Ashley Brosmer were among the first to come upon a serious wreck on the interstate near Charleston, West Virginia. According to Gaddis, the driver was “in a bad spot.” He and his colleagues did a quick assessment of the situation. This is what they have been trained to do. Their instincts took over. Despite not having any emergency equipment, the students and Fifer helped as best they could. “The only equipment we had was just us and what we have been taught,” said Leah Gaddis. The students and Fifer helped support the spine of the injured driver while firefighters cut him out of the truck with the “jaws of life”.